Welcome To Kalamazoo. Did You Know You'll Never Leave? Raven Britt was at a fundraising dinner a couple of years ago when a fellow guest made a prophecy that startled her. Raven had just moved to Kalamazoo, and she was telling the other guest about it. Is Kalamazoo "stickier" than other communities? "Why's That?" finds out. The man went on to suggest that no one really leaves Kalamazoo: not the native-born and not transplants. He said that people who take off for a while inevitably come back, and he told Raven that this phenomenon has a name. Raven grew up in Lansing, but she lived in New York City for more than a decade before she came to Kalamazoo. When this Kalamaglue conversation took place, she was still learning to drive in the snow. So that Raven can know whether she’s really committed to the Paper City for life, this month “Why’s That?” investigates the idea that Kalamazoo has adhesive properties. The Kalamaglue theory “stuck” with Raven as she met more and more people who seem to confirm it. People such as David Feaster, who lived everywhere from New Jersey to Arizona before he took a job in Kalamazoo in 1990. Feaster says he expected to move on to a larger city, but it never happened. “I ended up meeting a partner, falling in love, buying a house, the things that you do when you feel comfortable and established in a place,” he said. Feaster says he feels that his voice is heard in Kalamazoo. And he says he’s found it affordable, especially compared with the cost of living in a larger city. Raven met another transplant, Kori Jock, who moved here in 2000 to study at Western Michigan University. “And just kind of fell in love with this side of the state. I love how green it is, and how close we are to Lake Michigan and there’s so much less concrete and traffic than on the east side of the state where I grew up,” she said. Jock says she appreciates the sense of community in Kalamazoo, one that’s reflected by things like the Kalamazoo Promise scholarship. She left Kalamazoo for a while. “I fell in love and moved to Seattle to try to woo my now-husband into moving to Midwest for first time,” she said. That took a few years, but eventually it worked. 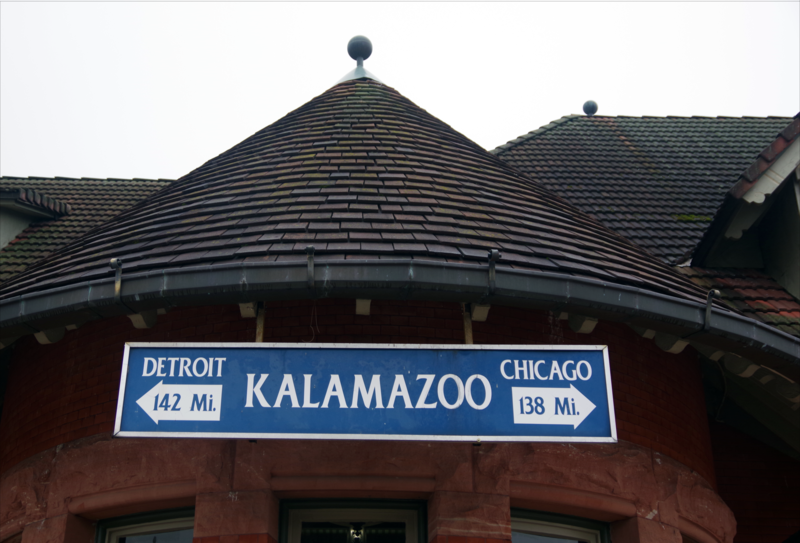 After considering different cities, Jock and her husband moved to…Kalamazoo. Clearly, some people who move to the area get attached. But there’s a problem with this supposed evidence of Kalama-gluiness. “The people that you’re talking to are the people that are here. They’re the people who stayed,” says Michelle Miller-Adams, a senior researcher at Kalamazoo’s W.E. Upjohn Institute for Employment Research. We reached out to Miller-Adams for a scientific look at Kalamazoo’s stickiness. She sees a selection bias at work. “You didn’t line up all the people who were here and hear from those who left and those who stayed,” she said. Consider the cohort of people who are now in their mid-to-late 30s who were born in Kalamazoo County. In 2015, roughly six in 10 of them still lived somewhere in the greater Kalamazoo metro area, according to The Opportunity Atlas, a project of the nonprofit research group Opportunity Insights. The rest of those native-born 30-somethings, roughly 40 percent, have apparently done the unthinkable and left Kalamazoo. Tim Ready is the director of the Lewis Walker Institute for Study of Race and Ethnic Relations at Western Michigan University. He says that in his reading of the data from the Opportunity Atlas, Kalamazoo County did not jump out as especially “sticky” for the native-born. Some Michigan counties, especially rural ones, do have much lower rates of retention than Kalamazoo, Ontonagon being an extreme example. Just 32 percent of native-born 30-somethings from Ontonagon County were still living in the area in 2015. But several Michigan counties including Wayne, Macomb, Muskegon and Ottawa have a retention rate over 70 percent, which is significantly higher than Kalamazoo’s. Montcalm, Kent, Oakland, Sanilac, Bay, Ionia and Kalkaska Counties are in the 60-percent-retention range - also higher than Kalamazoo. By way of comparison, Cook County, Illinois, home of Chicago proper, has a 76 percent retention rate for those native-born residents born between 1978 and 1983; Cuyahoga County, Ohio (Cleveland) a 69 percent rate; Lucas County, Ohio, where Toledo is located, a 66 percent rate; Allegheny County in Pennsylvania (Pittsburgh) a 73 percent rate, Erie County in New York State (Buffalo) a 71 percent rate; Franklin County, Ohio (Columbus) a 74 percent rate; Harris County, Texas (Houston) a 77 percent rate; Allen County, Indiana (Fort Wayne), 66 percent; Shawnee County, Kansas (Topeka), 61 percent. 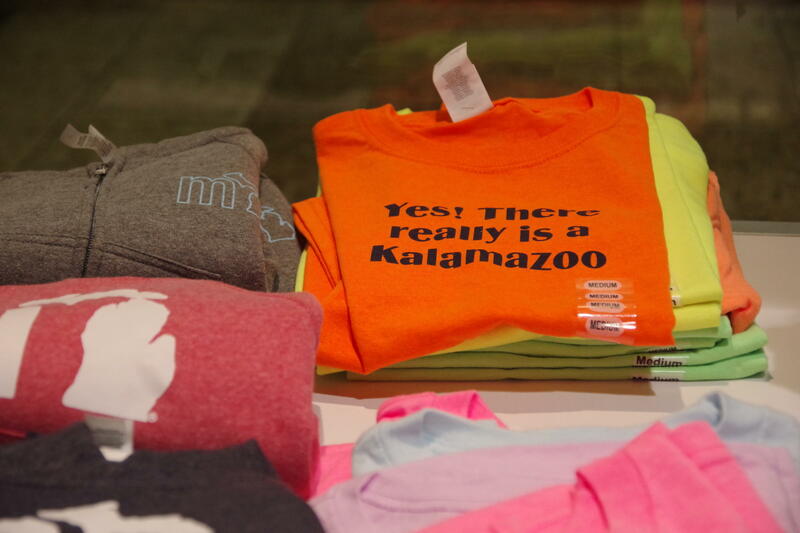 Shirts for sale in downtown Kalamazoo. “Counties where big cities are located generally are more sticky than Kalamazoo, and less populated counties tend to be less sticky -- especially those in the middle of the country. We are less sticky than most urban counties, in the Midwest and elsewhere,” Ready wrote in an email. That doesn’t mean that Kalamazoo isn’t adhesive for certain people, for instance, families with children in the Kalamazoo Public Schools. Miller-Adams says enrollment has grown by a quarter since the launch of the Promise scholarship. “It actually, apart from the first year when a bunch of new people came to Kalamazoo, it has to do with the decline in the exit rates from the district that fewer people than did in the past are leaving the district over time,” she said. Raven is not a KPS parent, and she’s a transplant rather than a native-born Kalamazooan. How likely is she to stay in the area? To get an idea, it turns out that you have to consider age. As Miller-Adams and her colleague, Senior Regional Analyst Brian Pittelko explain, how old you are factors into how likely you are to leave town. 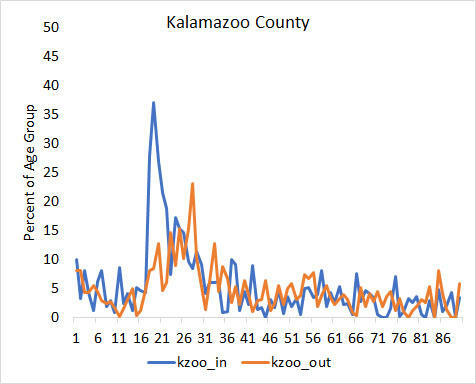 Miller-Adams and Pittelko looked at data from the American Community Survey on migration in and out of Kalamazoo County. “People don’t move around that much when they’re kids, but because we are a college town there’s a lot of moving in around the eighteen to 20-something-year-old [range] and then there’s a moving out spike as well, which is presumably when people are finishing college,” Miller-Adams said. In- and out-migration by age for Kalamazoo County, based on five-year averages for 2013-2017 from the American Community Survey. That pattern looks similar in Washtenaw and Ingham Counties. Miller-Adams says that for all three areas, after that early-20s moving-out spike, things change. “Everything flattens out and it stays really, really, really flat,” she said. In other words, people stop moving around so much. Things flatten out even faster in Kalamazoo than around U of M or Michigan State. The Upjohn Institute’s Brian Pittelko says he wouldn’t read too much into a year-to-year change. “But by about your early 30s wherever you’re living I hope you like it,” he said. The takeaway is that if you only look at age, you could reasonably conclude that Raven Britt is likely to stay put. Not because Kalamazoo is especially sticky, but because people generally don’t move that much after 30 here - as they don’t move that much after 40 in Ingham and Washentaw counties. 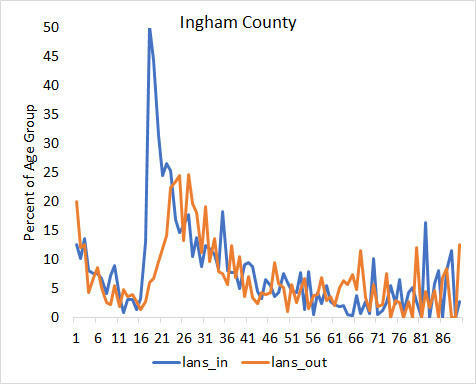 In- and out-migration by age for Ingham County, based on five-year averages for 2013-2017 from the American Community Survey. 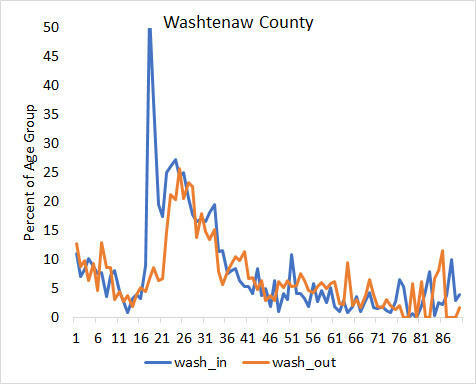 In- and out-migration by age for Washtenaw County, based on five-year averages for 2013-2017 from the American Community Survey. Kent County, for good measure. 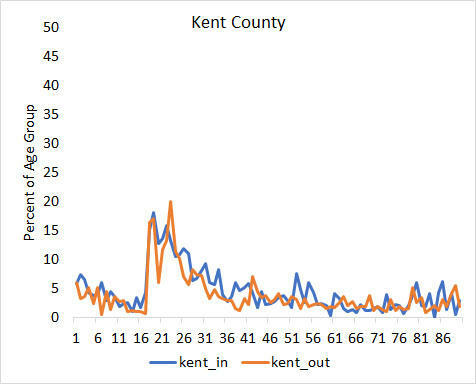 A graph showing In- and out-migration by age for Kent County, based on five-year averages for 2013-2017 from the American Community Survey. Who's Pumping Out Greenhouse Gases In Southwest Michigan? A report on our region's major sources of greenhouse gases. Mount Ever-Rest is different from Kalamazoo’s other cemeteries, and Jeff Sarnacki wants to know why. The name Cooper turns up all over Kalamazoo County. There’s Cooper Township, Cooper Avenue in Kalamazoo Township, Cooper’s Island in Schoolcraft. It's not an accident. A report on "James Fenimore Cooper country"